Hair Color: Available in multiple colors. Choose below. Hair Length: 18 Inches. 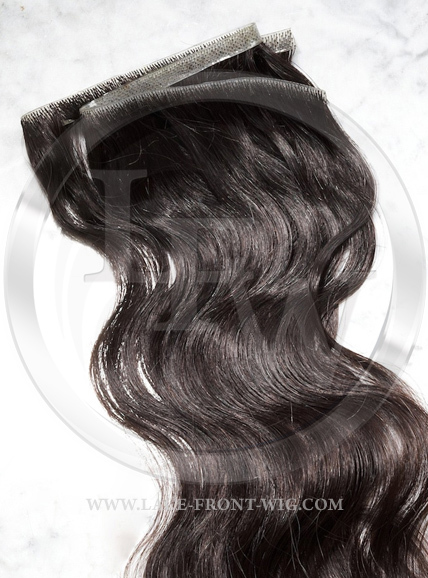 The hair is hand sewn into a clear skin base that is approximately a quater inch in width. You can apply with a clear piece of double sided adhesive bonding tape. You can weave, glue or tape the new skin graft hair weft directly into your own hair! Application: Self-application is easy and fast. Apply in 10 minutes! More Information: You are viewing the latest advancement in hair extensions to hit the market! 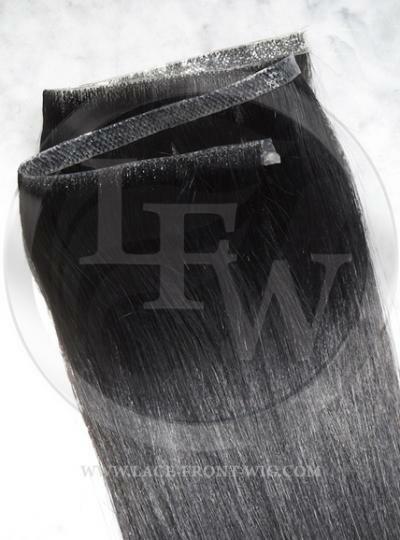 These skin weft hair extensions are brand new and are taking the professional salon industry by storm. The Skin Weft Extension is an exclusive product in hair salons that is quickly taking the place of traditional hair extension methods.The Skin Weft Extension is a 40-Inch long piece of thickly wefted 100% human remy hair that is attached to a strong durable double-sided adhesive tape, which can be instantly applied to parted areas of the head. 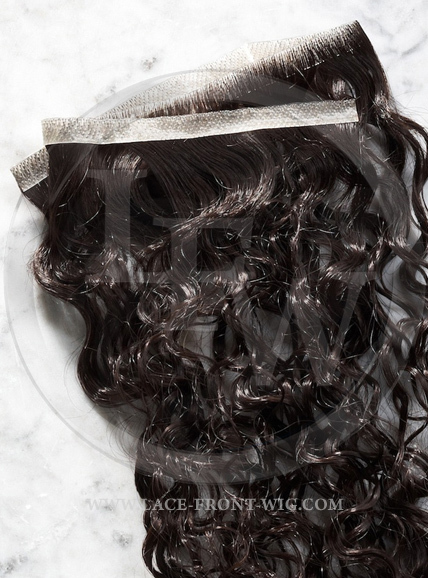 The hair is 18-inches in length along the entire 40-inch wide clear skin weft hair . How Does a Skin Weft Work? Directions: First, part hair on scalp into sections where application is desired. Second, peel off the white label on the skin weft extension tape and apply to sections on the head where hair is thinning, or where wanted hair is desired. Third, apply directly by using your hand and press with the double-sided tape against the hair you sectioned off (apply to very most upper part of sectioned hair, not directly on scalp). Your Finished! Its that simple and completely invisible! Looks like the hair is growing from your scalp giving an all-natural appearance. You can even wash your hair with no problem, sleep on it, and finally enjoy your everyday activities without harsh chemicals, or messy glues that are sitting and destroying your hair follicles. Question: I'm looking to create a artificial hairline is this the right product for that, Is it bleached knots..